WHO I FISHED WITH: This morning, Friday, 25 May, I fished with long-time friends and past business partners DJ Fuller and Allen Sandor, both of Salado, Texas. DJ fished with me last week as a guest of Marty Wall, then brought his 9-year-old son, Sam, out this past Monday. I met Allen for the first time this morning. DJ is a homebuilder and Allen focuses on commercial property. Allen Sandor with our largest hybrid striped bass taken on this morning’s trip. Although our target species was the hybrid, we caught lots of white bass today, too. 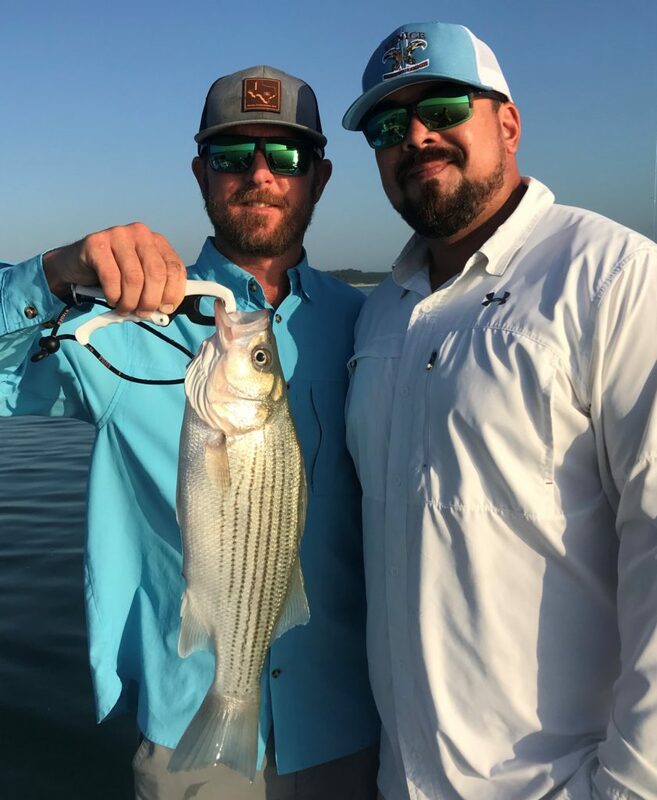 Allen commented that he was certain we took more white bass half way through the morning’s trip than he had taken all spring running up the Lampasas River on Stillhouse Hollow Reservoir. Low flows and low lake elevations prevented a strong spawning run there this season. DJ and Allen pair up for a “buds” photo on the first hybrid that fell for our presentations today. 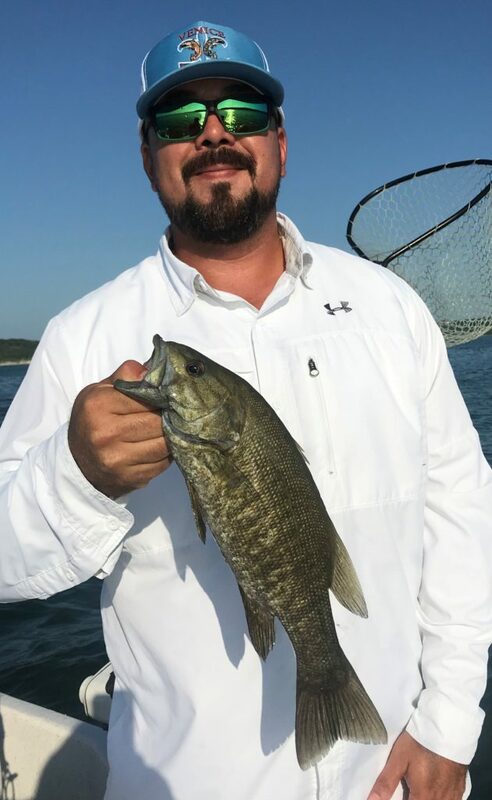 Allen came up with the first smallmouth I’ve seen come aboard on live shad thus far this 2018 season. WHAT WE FISHED FOR: We targeted hybrid striped bass using live shad the entire 3.5 hours we were on the water this morning. Under bright skies and light winds, the hybrid bite was predictably slow, but we picked them up steadily throughout the morning, along with white bass, blue catfish, a pair of largemouth, and a single smallmouth bass. HOW WE FISHED: This morning’s trip was only 3.5 hours in length due to DJ and Allen’s work schedules; the Friday before a holiday weekend is a busy day for fellows in their line of work getting people paid and coordination taken care of for a short week the following week. We fished live shad the entire trip on just two areas, the first in about 45 feet of water, and the second in 60 feet of water. OBSERVATIONS/NOTES: 1) Area SHAD14 produced ample bait in about 3 throws this morning on shad which are still spawning in the 80.2F surface water hitting the bank. 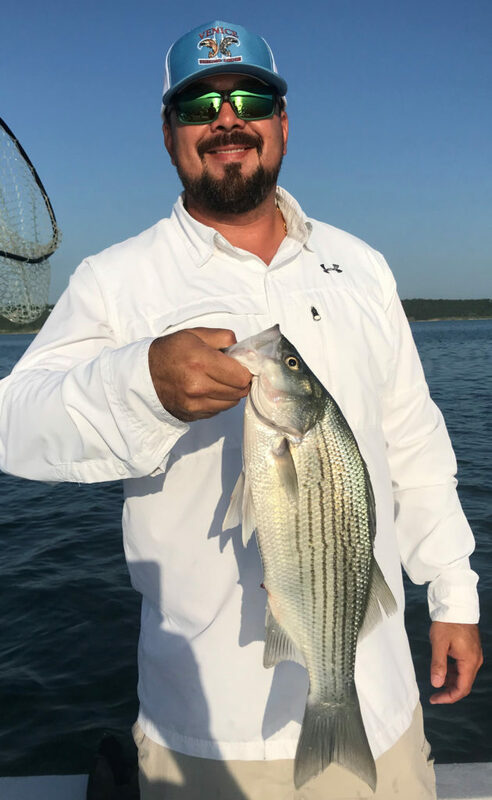 2) I was surprised to catch white bass and hybrid consistently at 60′ with baits set at 55′ as that is deep for this time of year — more evidence that the year is still running behind thanks to the cold winter and slow spring warmup.